A quality Amazon listing contains 5 elements: a descriptive title, compelling images, concise bullet points, a detailed product description, and competitive pricing. Adding listings to Amazon is quite easy, however, each of these 5 elements must be carefully crafted using Amazon SEO tactics if you hope to achieve the high search rankings needed to drive sales. For more in-depth Amazon SEO, like keyword search volume, competitor monitoring, listing improvement suggestions, or rank tracking, use Sellics’ Amazon Ranking Optimization tool. It makes it easy to write a compelling Amazon listing and rank high enough in search results to be seen by potential customers. Try it free for 14 days. Amazon SEO is what makes certain Amazon product listings rank higher than others in Amazon shopping searches. Amazon SEO incorporates the brand names, product names, and related terms that shoppers search for as keywords throughout product listings. Good Amazon SEO integrates these terms into product titles, descriptions, and other key areas of an Amazon product listing. Using brand and item names as keywords within Amazon listings seems simple enough, but there’s a hitch. 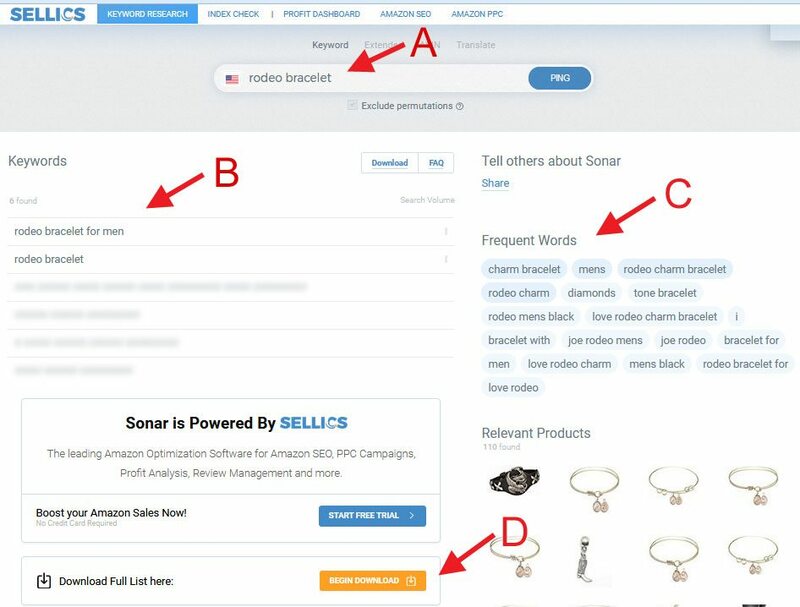 Not all shoppers looking for your products use the same words when they search. So, Amazon SEO keyword research is an important first step in crafting an Amazon listing that will actually drive sales. This research will show you the words that Amazon shoppers actually type into the search box when they search for certain products. These are the words you want to use to create your listing. Using Sonar, I entered “rodeo bracelet” (A). The free tool is limited, so it only shows a few direct results (B). However, it also displays “frequent words” (C), and even shows me related products currently selling on Amazon. This is all helpful information. Who knew “rodeo bracelet for men” was even popular? Not me, until now. Note that Sonar doesn’t give me specific search volume for these keywords in the free version. But right now, I’m just looking for additional terms to use in my listing. If you want to learn how to conduct more in-depth product and keyword research, we cover that in our article What to Sell on Amazon. 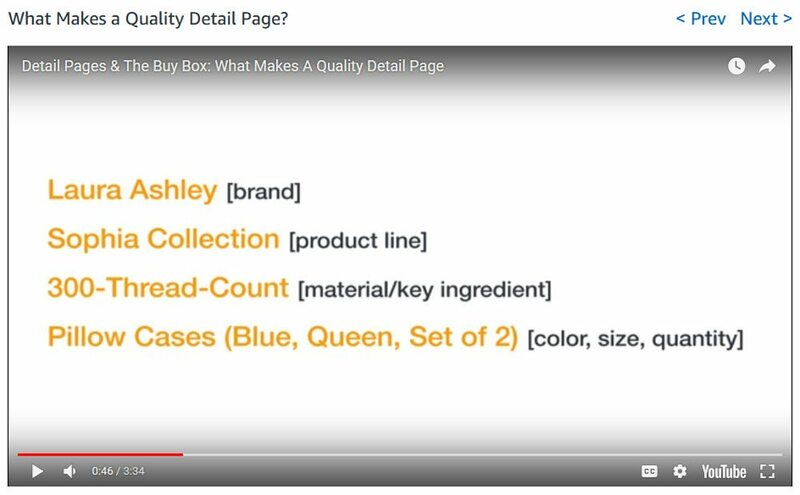 Now I’ll show you how I incorporate these 3 Amazon SEO keywords into all 5 elements of a quality Amazon listing, based on Amazon’s streamlined product listing standards. Sellers need to create quality listings for two reasons. First, if your product listing doesn’t meet Amazon’s quality standards, it will be flagged as low-quality and ultimately suppressed, killing your sales. Second, low-quality listings typically don’t rank well in Amazon’s product search, which also affects sales. So let’s look at the 5 elements that make a quality listing. As you can see, this item doesn’t have a specific brand, line, or collection. In fact, quantity really doesn’t apply to this either since most items in jewelry are sold per piece. So I used our Amazon SEO keywords: rodeo bracelet, rodeo horse, and horse bracelet, as the basis of our description. Then I added other descriptive words: rope letters, ladies’ and western, to highlight other details to catch a shopper’s eye. Amazon is serious and strict about the appearance of its site, and product images must be professional quality and accurately portray the product being sold. But that doesn’t necessarily mean you need to hire a professional photographer. You can capture amazing product shots yourself by using your smartphone camera, then editing your photos afterward to add the finishing touch. Photolemur is a photo editing software that optimizes your pictures automatically with Artificial Intelligence. It analyzes, adjusts, and enhances various elements of your pictures to achieve a professional quality photo. You can upload an unlimited amount of photos, and its simple operation will instantaneously transform them, saving you the time you’d spend editing photos one by one. Click here to visit Photolemur. While this isn’t possible in every case, Amazon highly recommends using a white background image for the main product image. Listings that don’t have this may be moved down the search results or receive low-quality alerts. You can learn how to shoot against a white background in our product photography guide, or the budget-friendly freelancers at Fiverr can remove backgrounds for you. Amazon allows you to upload a number of images for your product listing, and the more images you use, the better. Showing items in use, zooming in on fine details, and including different angles helps buyers visualize items and, hopefully, entices them to buy. Amazon has a minimum image size of 1000 x 500 pixels for all of your product images. This size triggers Amazon’s image zoom feature to give buyers a closer look. Amazon also requires that products should take up 85% of the image area, so trim out those backgrounds as close as possible. As required by Amazon, our main image is on a white background. The secondary thumbnail images on the left enlarge when a buyer mouses over or clicks on them. In those, we include images of the bracelet being worn to give buyers a sense of the proportions, plus show two different angles. We even include a close-up shot to highlight the rope detailing on the letters. All of our images also meet or exceeds the 1000×500-pixel minimum. So in our 4 product images, we’ve met Amazon’s image requirements for a quality listing, plus show buyers exactly what they want to see. Amazon listing pages feature a bulleted list of product details which Amazon calls Key Product Features in your product entry screen. Amazon uses the copy you insert here to create a bulleted list of product facts and features. Shoppers can quickly scan this list to learn specific details about your product. In addition to highlighting meaningful product information, you can maximize Amazon SEO by using target keywords in your list copy. Amazon lets you enter up to 5 lines in your list, and each line allows up to 100 characters. You aren’t required to use all 5 lines or all 100 characters per line, but you should try to use as much as possible since it boosts your Amazon SEO. Remember! Key features are a snapshot of important facts about your product. You still have one more area to give shoppers more information and really sell your product. We’ll look at that now. Amazon allows 2000 characters in your Detailed Product Description. So you have plenty of space to describe and sell your product using your Amazon SEO keywords, as we did above. If you know basic HTML codes, you can use it here to break up paragraphs, create a second bulleted list, or add bold headers. But, you can’t add additional images in this section, it’s for copy only. Your detailed product description is your opportunity to paint a picture for your shopper in a narrative style. Is your product a great gift idea? Mention that. Does it appeal to certain users? Discuss where they might use it, and how it can benefit them or add to their experience. And of course, work in Amazon SEO keywords wherever possible in a natural, conversational way. For more about crafting descriptions, check out our article on writing product descriptions that sell. Most successful sellers try to be the combined low price leaders, no matter how they present a product’s selling price or shipping fee. Some sellers list everything as “ships for free” but inflate the product price to cover costs. Others have low product prices and higher shipping costs. Still others use Amazon FBA, so their products can ship under Prime free shipping. This is why it’s imperative that you do your homework when deciding which products to sell on Amazon. With the Rodeo Bracelet, there’s just one existing competitor, so it can come in under their selling price and still make money. However, the competitor might lower their price now that this listing has been added. Amazon made sweeping changes to their product listing requirements in 2017. What we covered above is based on the new standard, and is what new listings must strive to meet to rank well in Amazon search results going forward. As you research products, you’ll run across listings that don’t match these criteria. You’ll find lengthy bulleted lists and rambling product descriptions. You’ll find terrible images, too. But these listings are being tagged as low-quality and will slowly disappear in favor of the streamlined version that Amazon now favors. One major benefit is that creating a product listing along the new guidelines takes little time. But you’re allowed less content than in the past, so you must maximize every Amazon SEO keyword opportunity. You can do this by conducting in-depth keyword research and further optimizing your listings with the help of Amazon-specific software, like Sellics’ Amazon Ranking Optimization tool. By using this software, you can take most of the guesswork out of crafting high-ranking Amazon listings. Click here to start a free 14-day trial. Do you sell on Amazon? Have you had to change your product listings to match the new quality requirements? What do you think of the new standards? We’d love to hear your insights in the comments below. I truly enjoyed your article as I am now drafting product listings on Amazon. One question I’d like to ask you – about the images. Can we use the second images to illustrate visually the product points? Otherwords, can we use the image (with no products) PLUS text (in the image)? Amazon changes their ruling on allowed images often, so it’s always best to check in the images documentation in Seller Central. Currently, you can include informational images within your image gallery to illustrate size and use. But I’d play it safe and have at least some representation of the item in every image, including the informational ones. That way, if they ever change the policy to state that all images must include the product, you’re covered. I hope this helps, good luck! Hi, Krista! This article is a great find for someone like me who is desperate for ideas following this Amazon’s new product listing guidelines. My question is: do I ever get notifications from Amazon perhaps indicating that one of my listings being tagged as low quality? Or I will just find it out on my own and hopefully before suspension notice. Amazon informs you of this in your Amazon Seller dashboard. They tag your low-quality listings in your inventory list, include them in a listing report, and also send you emails if you have listing problems. They definitely don’t keep these issues a secret! Glad the article is helpful, good luck with your Amazon pursuits. I enjoyed your article , Krista. Really gave me the information I needed. Thank you for reading and commenting! I’m very glad the information is helpful to you. Good luck in your Amazon pursuits.